The Crazies are an isolated range northeast of Bozeman in southwestern Montana. 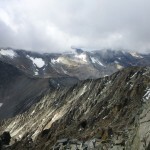 They are known for sharp ridges, a couple small glaciers, and high winds, and their highpoint, Crazy Peak, has over 5,000 feet of prominence. Though the peak is an easy dayhike, I managed to take two days thanks to said wind. This was for the best, as the scenic central part of the range is not visible from Crazy Peak, which lies near the southern end of the range. I used the standard approach from the east via Big Timber Canyon, where the access road threads through miles of private property, including a ranch well up in the canyon that is home to a friendly cat. After being kept awake most of the night by wind buffeting my car at the trailhead campground, I had some caffeine and started up the trail, hoping the wind would either die down or improbably not get much worse higher up. 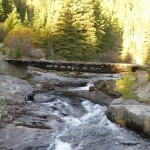 The trail looks like it might have been an old road, with a repurposed railroad bridge at one of the stream crossings. 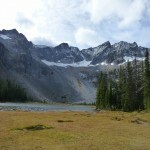 After a few miles, I turned left on the popular side-trail to Granite Lake. The Granite Lake area can evidently be crowded during the main season, but other than two campers on their way out, who momentarily mistook me for a black bear, I had the area to myself. Where the trail fades near Blue Lake, I headed straight up a talus hill, making my way toward the side of Crazy’s long west ridge. I hadn’t paid much attention to the route description, but there seemed to be plenty of options. 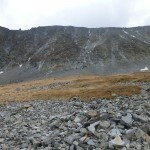 After a long slog up tundra to the base, I found that the talus on the north face of the ridge is all awful. I tried to stick to clean gullies and ribs where I could, but I was not in the best place to do so. I also tried to stay somewhat sheltered, as the wind was strong enough that gusts threatened to knock me over unless I braced myself. With a few hundred feet of wind-blasted talus between me and the ridge, my patience ran out and I turned back. On the way down, I managed to find a better route, with mostly turf, dirt, and rock on the face, and a couple of cairns and a bit of a trail below. The key is to continue around the shore of Blue Lake to a minor ravine or inlet stream, then head up the slabs to one side. 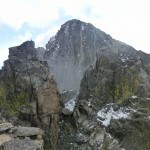 On the face itself, climb a rib relatively far left, between two close, parallel gullies. Returning around Blue Lake and wondering what to do with the rest of my day, I passed two cute young women in running shorts and their male friend (the second such meeting this season, oddly), apparently debating what to do. I passed silently — I prefer not to pester people — then returned, figuring they might be headed the way I had just come. It turns out that they were, but my account of the wind changed their minds, and we all headed back down the trail. I had expected to leave them behind, but (atypically) they used their running shorts to run, and didn’t seem to find me particularly annoying or bad-smelling, so we all jogged down the trail together. It was the first running I had done in awhile, but I felt fine for the time being. Switchbacking back toward Big Timber Canyon, we met an older couple with their college-age son on their way up. 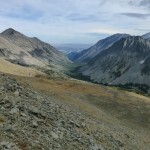 The woman was very insistent that we head up past Twin Lakes to tag Conical Peak, as we would otherwise miss out on the authentic Crazy experience. Back at the junction, there was the usual dithering one would expect from a group of four, but we eventually headed up toward Twin Lakes. 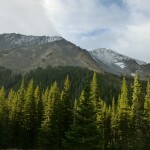 As the woods opened up near the lakes, I saw that the woman had been correct: this part of the range is much more rugged than the area to the south, with some sharp, unnamed peaks behind the lakes sheltering a small glacier. The trail continues up to an odd pass well above the saddle between these peaks and Conical. We followed the trail partway, then headed straight up a mixture of rock ribs and decent talus toward Conical’s south ridge. Sheltered from the west wind on this slope, we had a pleasant climb, though my out-of-shape self was suffering. Nearing the ridge crest, the others headed straight up while I, anticipating the wind from the other side, stayed below the crest for a bit. Popping up at a notch, I was instantly struck by the howling gale; looking back a bit on the ridge, I saw that the others had decided not to fight out the last little bit to the summit. I couldn’t blame them, especially the two in shorts. Though I had enough clothes for the last bit, I didn’t care enough about Conical Peak to bother. 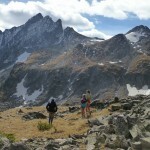 While the others descended the sheltered side, I took a little side-trip to the pass, then rejoined them on the trail. Jogging down the endless switchbacks, occasionally ducking and staggering in a gust of wind, I started to feel my lack of recent running, but kept up for the time being. I jogged as much of the flatter trail in the valley as felt comfortable, talking with Ruby, who had been a cross-country ski racer, but eventually let her go on ahead and walked the rest of the trail, reaching the parking lot seconds before the others. With plenty of food and nothing better to do, I spent another night at the trailhead, hoping the wind would calm down. I woke the next day to mostly-cloudy skies, but thankfully less wind, and hobbled a more efficient path to Cloud’s west ridge. 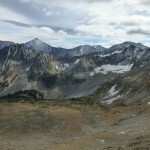 Following a faint and partially snow-filled trail along the crest, I found easy going up to a broad flat separated from the summit by several sharp notches and pinnacles. Here I found some surprising class 3-4 scrambling while downclimbing the right-hand side into the first notch, which is the top of what looks like a fun snow/ice climb. 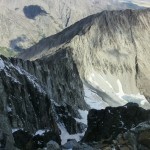 From there, more class 2-3 scrambling to the right of the ridge led to the summit. The sun finally emerged, so I was able to enjoy the summit for awhile from a sheltered spot. I screwed up the return a bit, crossing more loose talus than necessary — this peak would really be better as a spring snow climb — but made it back to the car without incident, pleased to have both ticked off a peak on the ultra-prominence list and seen the more scenic part of the Crazies.